Crowns, often referred to as “caps”, either replace missing tooth structure or repair broken teeth. In order to restore a missing or broken tooth, a crown is placed partially or fully around the remaining structure with one material or combination of various materials. Using crowns is just one way to restore a broken or crooked tooth, or even change the color of a tooth. The fabrication of crowns can be made from a variety of methods and materials. It is important to discuss all options with a dentist when considering which material is best suited for your mouth. Each material has advantages and disadvantages. For example, ceramic crowns are most natural in appearance and very aesthetically pleasing, but may not last as long as metal counterparts. 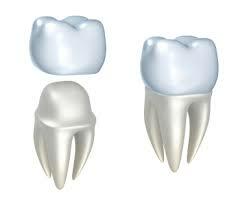 Gold crowns offer unmatched strength; however, they are not enamel colored and much more easily noticed. Your individual circumstances and preferences will aid in choosing the perfect custom crown for your smile. Make an appointment with Dr. Roe today to see how he can effectively transform your smile through crowns.